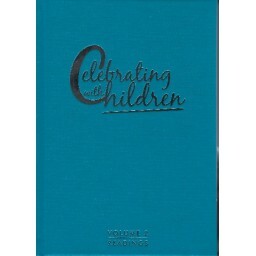 This is a revised edition of the popular children's liturgy resource, first published in 1990. This new edition in two volumes includes the revised translation of the Order of Mass. CELEBRATING WITH CHILDREN - READINGS is a collection of scripture passages (First Reading, Responsorial Psalm, Gospel Acclamation and Gospel). It follows the same prayers as are contained in RESOURCES. Also included in the compaion volume is a section with the Scriptures in dialogue form and the text of all the General Intercessions offered in the sample liturgies, arranged alphabetically by topic. The authors have compiled this material as a response to all those, and particularly teachers, catechists and priests, who have indicated a need for a basic resource to be used for planning liturgy but which, at the same time, also respects the principles that govern good liturgy. For durability each volume is hard bound with large print and sturdy paper. Ribbon placeholders provide additional ease of use.